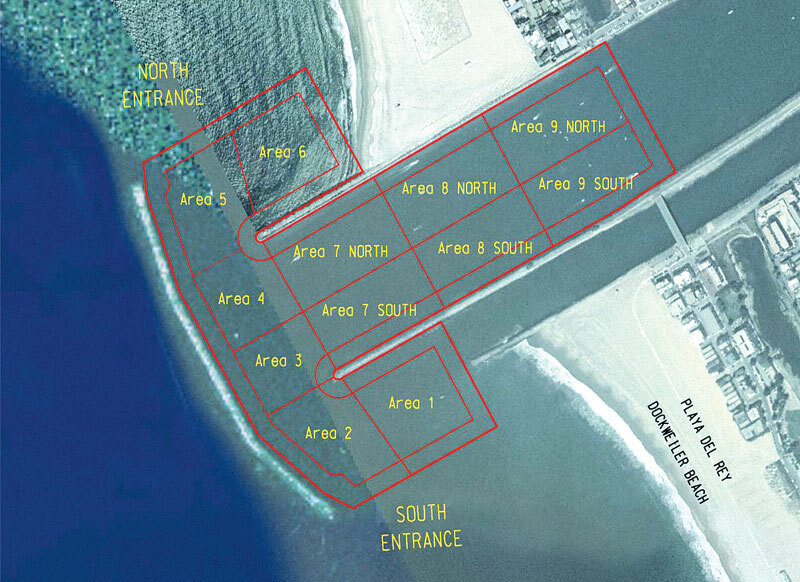 LOS ANGELES — In a unanimous vote, the Los Angeles County Board of Supervisors approved a 1 million cubic yard dredging project at Marina del Rey’s channel entrance that will remove contaminated sediment from the area, while cleaning up navigational hazards for boaters in the process. The board’s approval and agreement with the Army Corps of Engineers and the Port of Long Beach paves the way for 760,000 cubic yards of contaminated sediment in the channel to be dredged out and deposited at the Port of Long Beach’s Middle Harbor Project site, for use as contained fill material. As part of the Port of Long Beach’s $650 million Middle Harbor redevelopment plan, the port has been requesting sediment from outside sources to fill in nearly 54 acres of water area between two marine terminals, where the port plans to create land to construct a new shipping terminal. The Confined Aquatic Disposal cell in Long Beach gives nearby harbors with contamination problems a cheap and efficient alternative to dispose of sediment that otherwise would require costly transportation to approved landfill sites. The maintenance dredging and Redondo Beach sand renourishment projects are expected to cost $10.7 million, with $5.4 million in funding coming from the Corps of Engineers and $5.3 million funded by the state’s repayment of the Motor Vehicle License Fee (VLF) gap loan. According to the Board of Supervisors staff report, the contaminated sediment includes toxic chemicals, insecticides, chlordane and heavy metals such as arsenic, lead, mercury, nickel, cadmium, copper and zinc. Marina del Rey’s agreement to barge contaminated sediment to Long Beach’s concrete-lined disposal facility is expected to save the county more than $85 million and eliminate 42,000 truck trips that would have been required to move the dirt to inland dump sites. Earlier this year, more than 80,000 cubic yards of contaminated sediment from Newport Beach’s Rhine Channel dredging project were delivered to the port, and the city has plans to send more sediment from the upcoming Lower Newport Bay dredging project. The Port of Long Beach estimates that it will require nearly 2.3 million cubic yards of sediment to fill the gap between the marine terminals at Piers E and F.
“Besides being a win for both of these communities, we are saving millions of dollars through an environmentally sound solution,” Knabe said. Marina del Rey was last dredged 12 years ago. Since then, more than 1 million cubic yards of sediment from Ballona Creek and neighboring beaches have accumulated in the harbor. According to officials, a severe buildup of sediment around the north and south entrances to Marina del Rey has reduced navigation for recreational boaters and has also created a safety risk for first responders in the area, including the Coast Guard, Los Angeles County Lifeguard Baywatch and the Los Angeles County Sheriff’s Department Marina del Rey Marine Patrol. The project is scheduled to begin in January, with construction expected to be completed by September 2012.